Media personnel will be allowed to observe Committee on Public Enterprises (COPE) proceedings under special approval from the Speaker, the Government confirmed the Parliament yesterday. 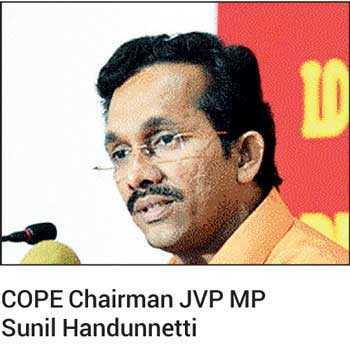 COPE Chairman JVP MP Sunil Handunnetti believes such a move will enable the public to be aware of the difficulties COPE faces to summon retired public service officers to appear, conduct an inquiry, collect evidence and to reach a decision within a limited timeframe using insufficient resources. “If we expect to have the State institutions function without corruption and fraud, that endeavour would be 80% complete if we allow the media to observe these committee meetings and report on it,” he said, exploring the possibility to admit media from next week. According to Minister of Public Enterprise, Kandyan Heritage and Kandy Development and Leader of the House of Parliament Lakshman Kiriella, the Standing Orders of the Parliament provide necessary provisions for the decision. “The Speaker can invite the media to these committee sittings. I inquired about this from several former Secretary Generals and it was confirmed that these committees can invite outsiders to its sittings with the approval of the Speaker,” said Minister Kiriella, opening the door for media to take part in COPE investigations for the first time in Parliament history.